The Reliamed Extension Tube for Leg and Drainage Bags has a 18" kink-resistant extension tube with adapter. Connects external or foley catheters to leg or bedside drainage bags. I used to purchase Bard Latex, when they became unavailable, this was my choice of purchase. So far, I have had no problem. Sturdy. Safe. Lightweight. better sleeping movements. Since adding this extension to my overnight bag I now have more flexability of movement and are more comfortable sleeping. Lightweight. Sturdy. Easy Storage. Thick Tubing. I use the tubing Just as a extension to the one attached to my leg bag. It lets me have enough tubing so I can be comfortable. 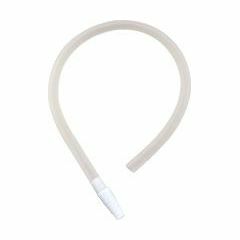 Does this fit the funnel in a intermittent catheter? Funnel end catheters are all the same size. To answer your question, yes.